How can Gemstones help you? Vedic astrology says that each Gemstone represents a particular planet, and wearing the planet's gemstone will attract positive vibes and enhance the planet's effects in your life. 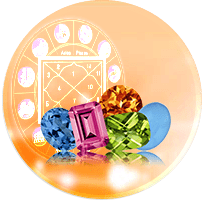 Your Ascendant (Lagna) is the most important house and wearing its Gemstone will enhance your your overall fortune. That's why the ascendant's gemstone is considered the most basic and important gemstone that you can wear. Fill in your birth-details below, or select your Ascendant from the list to discover what's the lucky gemstone for you.